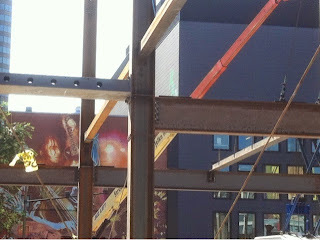 As the first post on this blog, I would like to share a picture that was taken 2 weeks ago on a job site in Montreal. This project uses a combination of steel structure and hollow core slabs. Through the use of Deltabeam (the gray beam in the picture), the builder was able to locally reduce the floor thickness to 200 mm + topping: the same thickness as the hollow core slab. On the upper levels of this building, the slim floor was needed specifically for mechanical systems integration. At the parking level, Deltabeam was used throughout the floor structure to increase clearance and reduce the use of fire resistant material. Welcome to Peikko Canada's blog!